To the majority of people, a plasma cutter seems like something that would be found on a movie used as a fictional weapon. However, a plasma cutter is actually very simple to use. A plasma cutter works by making use of an electrical current and an inert gas. This combination is pushed through the top of the cutter at a great speed. What you get when you cross those two is a tool that is able to easily slice through metal, and the result is a smooth cut. Below you will find some of the main uses of a plasma cutter and what they are most likely used for. There are many artists that have gone far beyond painting and sculpting; they are now using plasma cutters to create their art. 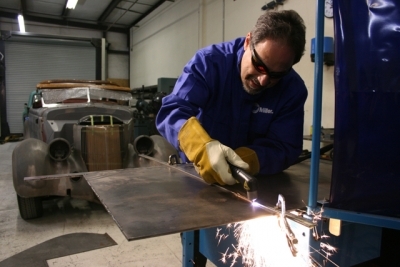 Artists will usually use a type of plasma cutter that is made for commercial use rather than industrial use; however, the results are the same for both. A lot of artists like to use this tool because it’s able to make very small cuts. They can also create their own stencils that they can then use later when they are creating art. It’s a very helpful tool that creates some of the finest art of the century. There are many junkyards all over the world that hold old cars and trucks that have been damaged or abandoned. The only problem is with all of these cars, a lot of the junkyards run out of room for more vehicles. This is where the use of the plasma cutter comes in, using them to cut down pieces of the metal to sell them as scrap metal. This helps to increase the productivity of the junkyard, as well as the amount of space that they have for incoming vehicles. A lot of plumbers that are working on the spot need to cut pipes and don’t have time to use a lengthy method. Using other tools take up too much time and use too many resources, while a standard torch would burn the pipe and warp the ends, making the situation much worse. A pipe needs to be able to fit together like a puzzle, and the only way to achieve this is with the use of a plasma cutter. It will make it much quicker to get the job done, and it also makes the edges smooth so they will slide together nicely. When you are talking about using the plasma cutters within industrial manufacturing, they are generally controlled by the use of a computer. The main reason for this is to be able to create the exact same cut thousands of times without making any mistakes or messing up the cut. The industries that this is seen in most are the air conditioning and heating. However, the use of the plasma cutters is not limited to just these industries, as there are many more that might use them in their business workplace. Timothy Wallace is a professional plumber running his own business out of his garage. He recommends plasma cutter to complete the tasks on time with the least amount of resources.